Nitty-gritty. : SO LOVING THY NEIGBOUR! 'A cop lives in the same building with us?' Hubby asked this morning as he walked into the bedroom after dropping off our kids at school. 'Yep!' I replied, as I picked up our baby for nursing. 'I never knew o!' Hubby said. 'Neither did I until I was chanced to meet him on his way to work hurriedly one evening when I went to check the mail'. I explained. 'How did you know?' I asked. 'I saw him at the car park'. He replied. My cop neighbour lives directly opposite us, yet we barely know each other! I cannot really recognize him or any of his family if we meet somewhere else. Yes, people, it is that bad! And funny enough, I kind of like it sha! Surprised? Don't be o! 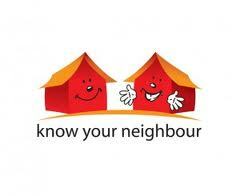 It makes the law 'Love thy neighbour as thyself' much easier to fulfill. Nobody go vex say, you no greet am! Nobody go jealousy you say, you dey denge pose! Nobody go say, I no like the kain eye you take look me jor! You don't know me, I don't know you, NO PALAVA! Everybody waka go their own jejely. I only hear footsteps, doors opening and voices. I seldom venture out myself even before I put to bed. And when I do, I see one or two person, daz all! Well, summer is kicking in, so there would be more activities, especially at the pool, play ground and barbecue area, but we still would not socialize! When people don't cross their boundaries, there would be peace, because no over-familiarity or see-finish that usually cause strife among people.